Hampshire Mezzanine Floor can provide a number of Single and Double Skin Steel Partitioning solutions. 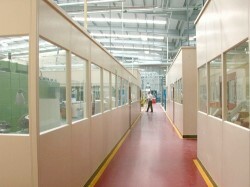 Steel Partitioning is ideally used in an Industrial / Production environment or for Clean Room applications. It is used to secure and guard machinery, or just to enclose areas where appearance is important. The panel selections can be all steel or steel/glass/steel, whichever suits your application. Steel Mesh Partitioning enables product to be stored and protected, but still viewed. 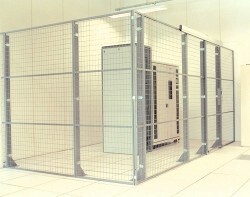 Mesh Partitioning is an ideal application for use of storing hazardous goods and high value security products. It is a cost effective solution and simple to install as it is demountable and relocatable. It is suitable for external use when hot dip galvanised, in cold refrigerant rooms and warehouse/production environments. Mesh Partitioning can also be used with Pallet Racking installations, helping to prevent items falling into aisleways. For more information and a site survey, please contact us.